Our start in the dark. Peter and I love our spontaneous travel lifestyle so when my niece invited us to join her and a climbing buddy on the hike, we jumped at the opportunity. Somehow our best laid plans to stay home on the weekends and get stuff done around the house never actually work out. 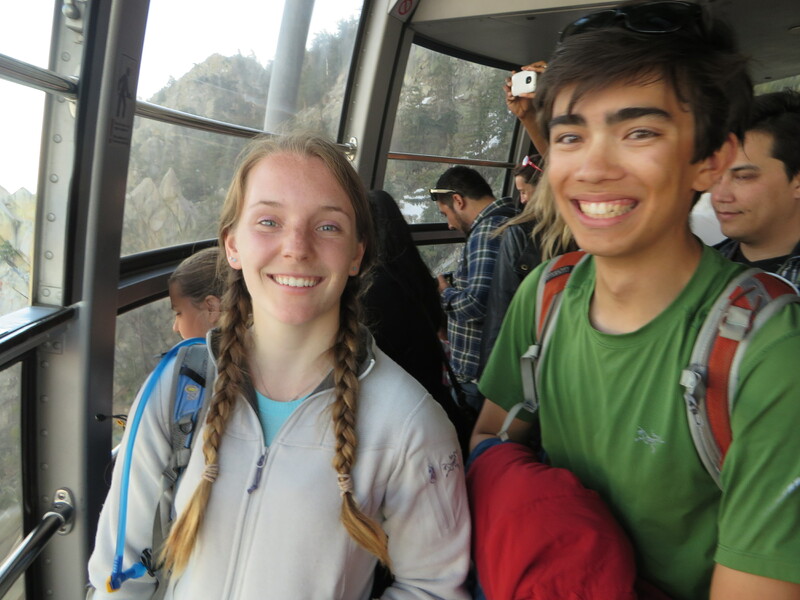 Here they are, Derek and Sabine, the inspiration for C2C round two. Sometimes, in the grind of weekday life, I forget why I work so hard at the gym and push myself to hike, bike, weight lift and run. But an invitation from my niece to hike C2C one week in advance is exactly why I push myself to get out the door. I want to say yes to strenuous physical activities without having to stress about whether or not my body will be able to handle it. We left our house at 3:30am to drive to the Palm Springs Art Museum. You park at the Art Museum but finish at the base of the aerial tramway. So, if you are thinking of trying this, make sure you have a plan for a ride back to where you parked. The trail behind the art museum, in a choose your own adventure fashion, winds up the mountain and eventually becomes the Skyline trail. 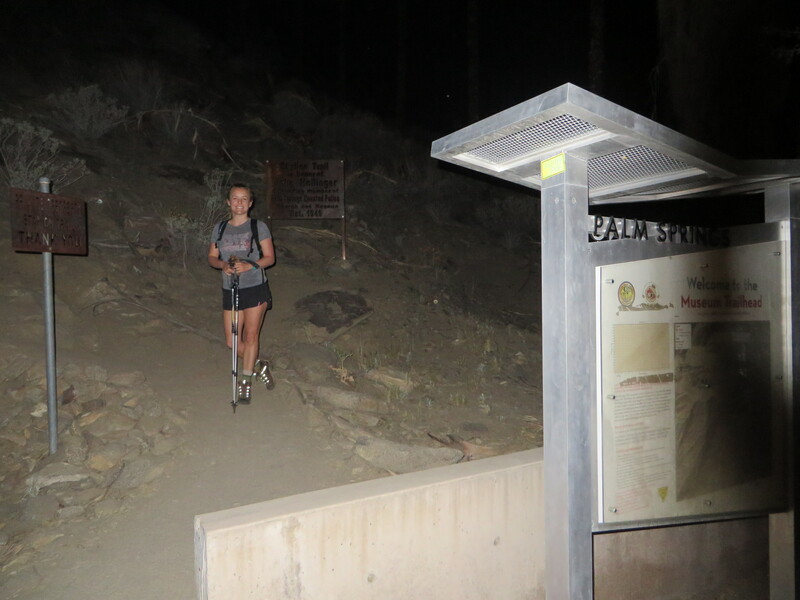 The Skyline trail journeys 10 miles straight up the mountain to the Palm Springs Aerial Tramway and then continues 6 miles farther to the top of San Jacinto Mountain. When Peter and I arrived at museum parking lot, we realized we weren’t alone, there were at least 20 other cars, presumably hikers who started before us. Looking at all the other cars made me a little nervous considering we were starting at 5:30am. Thoughts were swirling in my head, mostly around whether or not we should have been a little less confident and started earlier. 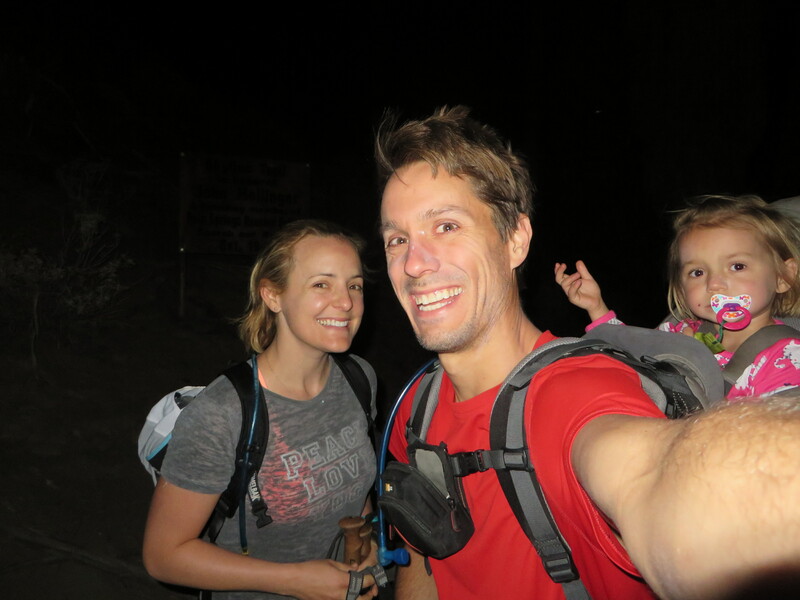 As is stated in some of the posts I read about the hike, the trail is a little confusing to follow at the start with a headlamp, but we soon realized- as long as you are going up, you can’t really go wrong. After the sun rose, it was a no brainer. Peter uses this fact to argue that starting in the dark is unnecessary. You will be able to hike faster in the daylight when route finding is less of an issue. 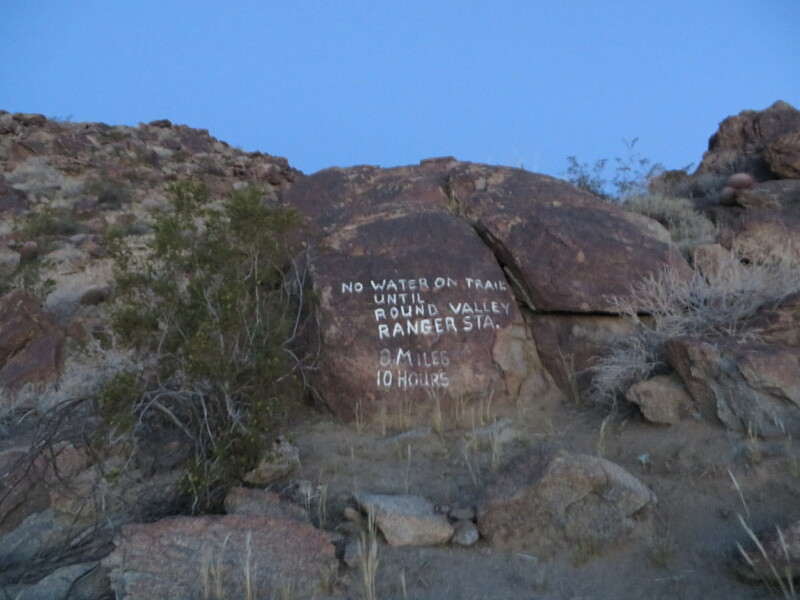 In his defense, if you are a strong hiker (by strong hiker I mean can you climb 1,500 feet or more an hour and take few rests) you probably don’t need to start in the dark. Not much more to say about the hike except now I know why it has the reputation for being dangerous. Not because the trail itself is dangerous but because if you are underprepared or not strong enough it is not going to be a fun day. The first 10 miles are in the direct sun and climb 8,500 feet. If you don’t know what that means, imagine being on the stair climber at the gym, in the sun, for 8 hours and you get the picture. 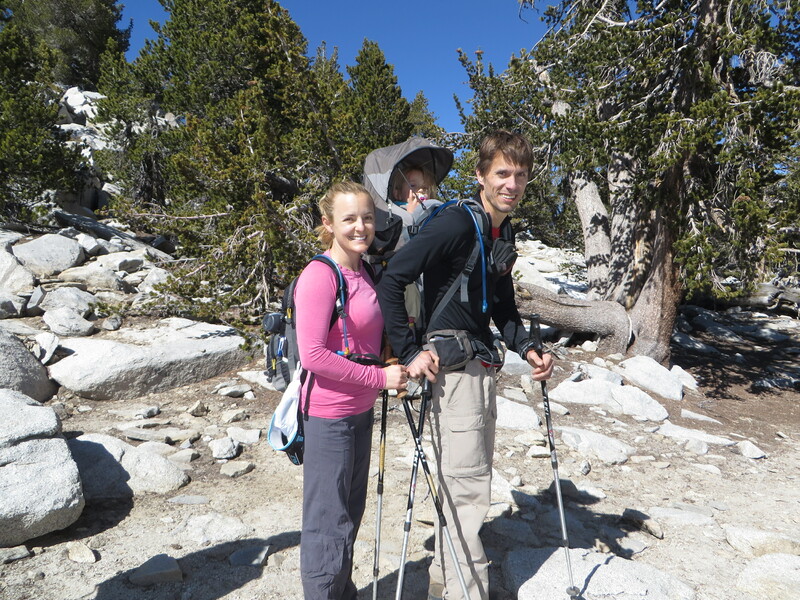 We are strong hikers and my husband was carrying a 27lb almost-3-year-old making the total weight of his pack 54lbs. I was carrying 13 lbs. You must carry all your water with you because like the pictures states, as there is no water available during the first 10 miles. We consumed 200 ounces of water and were both carrying 100 ounce camelbak bladders. We hiked the first 10 miles in 6.5 hours, with about 30mins of total rest time. We passed a lot of people, some of whom we never saw make it to the top. If you are inexperienced, I would recommend passing on this hike until you have done enough hiking to feel confident that your legs can carry you up hill for 12 hours or more. And unless your child is very comfortable sitting in the backpack for 10 hours I do not recommend taking your little one. Sage has been on countless hikes, and a handful of multiple day backpacking trips, and has logged hundreds of hours on long car rides. We know she can entertain herself with nothing but her imagination and be happy in a confined space. 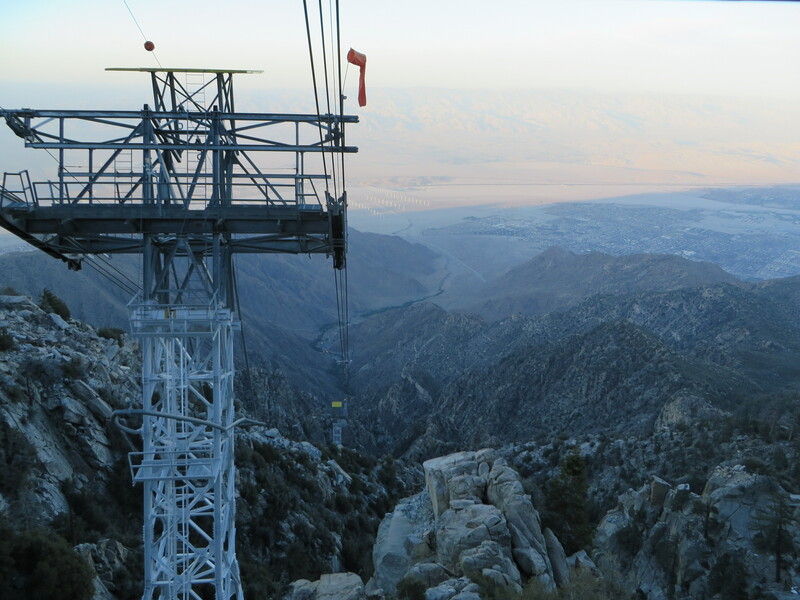 Total time from the Art Museum to the top of San Jacinto mountain: 10 hours. Total time from the Art Museum to the summit and back to the tram: 12 hours. Despite how physically challenging this day was, nothing beats the feeling of accomplishing a family goal. We couldn’t have been happier or more tired. Sage took some hiking breaks and enjoyed playing in the snow. Peter taking a well deserved break at the ranger station. Sabine, Sage, and Me at the tramway. I am so proud of this girl for her perseverance, commitment, and passion for the outdoors. View from the tramway descent. 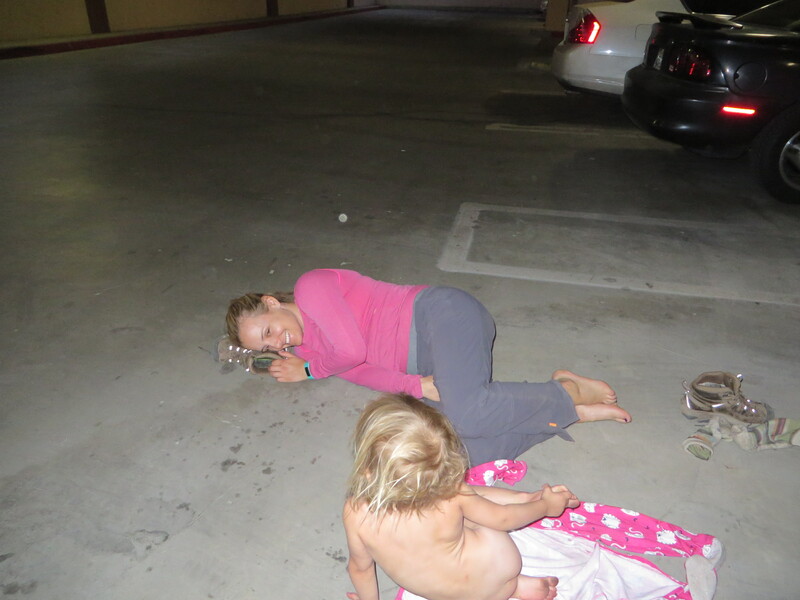 This picture pretty much captures how I felt when we finally got back to our car. 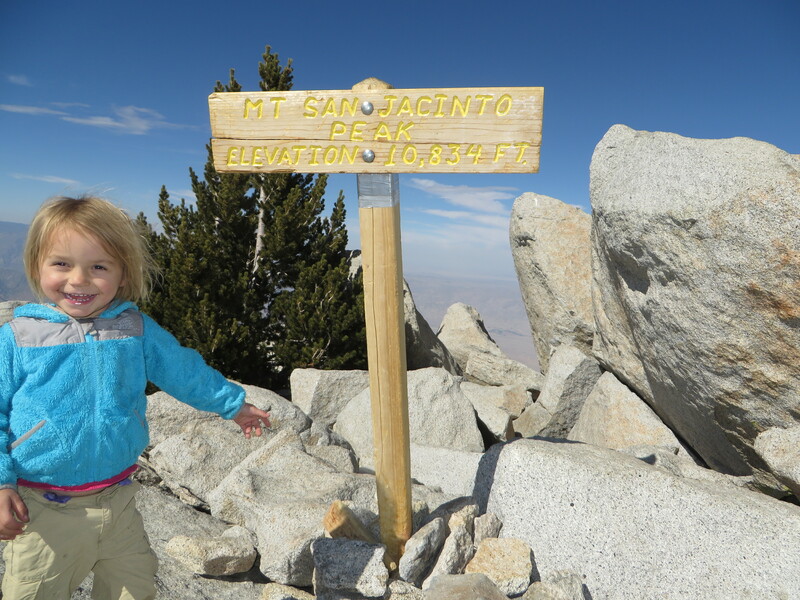 This entry was posted in hiking, Running/hiking and tagged c2c, hiking, San Jacinto. Bookmark the permalink. I can’t believe this doesn’t have any comments! That is a *crazy* adventure with a two-year-old and really incredible! James and I hiked San Jacinto from Idyllwild in 2006 (16 miles roundtrip, but 8 of them are downhill), and that was a nice, long day. I am inspired… maybe I will try the C2C next time I’m in So Cal.